YAY! Michael Jackson in the background!!!! Tammy.....I need to text message you! LOL! Ok Tammy, no disrespect but i think you have things a bit confused Felicia is indeed a die hard twilit fan, but she was only that excited because peter was the first celebrity she's met. just because everyone didnt wear their emotion on their sleeve doesnt mean they aren't a die hard fan. 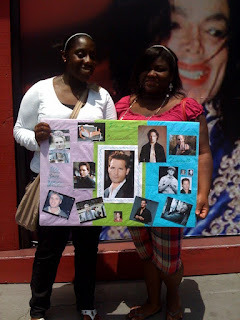 and by the way the poster was a joint effort she didnt make it alone. the girl standing right next to her(my sister) was very hurt that your site made it seem as though felicia was a lone soldier on trek to peterhood. in all actuality she(the unnamed) was the true die hard peter fan. by the way my sister informed felicia of the twitter bet and she(felicia) didnt feel the need to follow him. die hard fan? yes i'm sure. next time get facts straight before you make a post. or at least put the names of both people in the picture, even if i didnt know them that would seem rude to me. I was there too! Felicia was so cute. She was very nervous. We did tease her a bit, but not to be mean, just to ground her. She was soooo nervous. Just because she was the one that was obvious in her nervousness and our comments on that, we don't in any way mean to say that anyone else there was not a "die hard" fan. With that being said, I know her friend was just as excited to meet Peter, she just showed it in a different, more subtle, way.We enjoyed our time waiting with everyone, Felicia and her friend (I won't mention the name)especially, very much! We hope to see you again, at another event! Thanks Anonymous for stopping at the site! Your 'sister' is a very sweet girl and if I hurt her feels I apologize but here's my take on this situation....I asked Felicia if she was willing to take a picture for the blog when i saw her poster, yes there were others who were even MORE die hard then Felicia. Was I rude for not taking their picture or naming a few in the crowd shots? No. I was just giving my opinion. And not everyone is willing to be on a blog (and since I get shy about asking this was easier for me). Your 'sister' seemed reluctant to take the photo so I didn't ask. And don't get it twisted....I'm not confused about anything. Wait, so anonymous is upset because Tammy didn't put her sister's name on the blog? Wow!